A synergistic formula of 6 rainforest botanicals which are traditionally used in South America. For more information on the individual ingredients in the Spiro formula, follow the links provided in the plant database files in the Tropical Plant Database. This product is backed by Raintree’s unconditional guarantee. Ingredients: A proprietary blend of chanca piedra whole herb (Phyllanthus niruri), Bellaco caspi bark (Himatanthus sucuuba), tamamuri bark (Brosimum acutifolium), matico leaf (Piper aduncum), huacapu bark (Minquartia guianensis), and ajos sacha bark & leaf (Mansoa alliacea). This product was fully featured in an indepth article by the Health Sciences Institute (see page 4). HSI – Spiro – Lyme Disease Which shows how effective they proved against Lyme Disease. 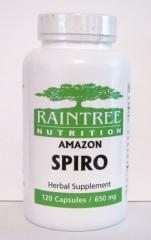 Spiro is a new herbal preparation for Lyme Disease. As the HSI article shows. In a relatively recent study of a 100 people, that all have Lyme Disease that was diagnosed within the last 5 years, the results were truly amazing. Now although re-testing was not a requirement at the end of the trial period, simply because Lyme Disease testing can be very expensive, 10 of those participating decided that they wanted to be tested. All 10 of them tested NEGATIVE! Suggested Use: Take 2-3 capsules twice daily or as directed by a health care practitioner. All of the plants in this formula have demonstrated antimicrobial effects in laboratory studies. Supplementing the diet with probiotics and digestive enzymes is advisable when this formula is used for longer than 30 days.